Stephanie is Vancouver’s most experienced legal recruiter. She has built the trust and confidence of a large network of lawyers, hiring partners, and executive teams. After several years practicing as a lawyer with a major Vancouver firm, Stephanie made the switch to legal recruitment in 2000. Since that time, she has helped partners, associates, legal teams, General Counsel, and in-house Legal Counsel secure new opportunities that meet their personal goals. Stephanie is equally committed to her clients seeking to hire and to her candidates seeking to move. What she loves about recruitment is getting to know who she is working with – whether a transitioning lawyer, a team of lawyers or a hiring manager – and giving them the information they need to make strategic, well informed decisions. Stephanie is a firm believer in the grounding principles of Hunter West – Respect, Relationships, Results. By showing, and expecting, respect in her professional relationships, Stephanie delivers results to her valued clients and candidates. She invites you to be part of that. Mike was born in the small and ethnically diverse corner of East Vancouver, where he honed some of the talents that would be useful to his current profession as a legal recruiter. 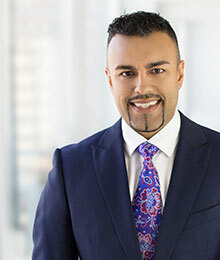 Goal-oriented and determined, he set out to forge a path of his own by obtaining his Bachelor of Arts degree from the University of British Columbia and then his law degree from the University of Victoria. When presented with an opportunity to article at Burnet, Duckworth & Palmer, Mike enthusiastically traded in his beloved Canucks cap for a cowboy hat. In Calgary, he fostered his legal knowledge as an associate in the finance and corporate departments. However, Mike longed to further his expertise in the international market, and thus packed up his belongings and moved across the pond to work as an associate at SJ Berwin in London, England. Eventually the fresh air and mountains summoned him home to Vancouver where he joined the law firm, Blake, Cassels & Graydon LLP. In the next phase of his career Mike was looking to do something different, yet related to law, and he found the perfect balance with the world of legal recruitment. Mike's diverse legal background combined with his genuine affable nature gave him the ability to easily connect with all people looking for a change in their legal career. He enjoys the challenge of finding the perfect fit for associates and partners at law firms and companies across Western Canada. JoAnne has specialized in legal recruitment for administrative professionals and law firm management since 2007. 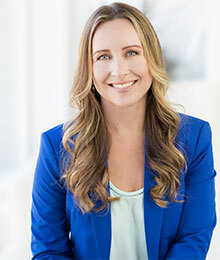 She is passionate about legal recruitment and well-connected in the legal community. JoAnne has built a reputation for taking the time to understand the needs of both her candidates seeking to move and her clients seeking to hire, making every effort to secure the right fit. JoAnne is respected for her supportive nature, personalized service, and commitment to success. Originally from Oshawa, Ontario, JoAnne graduated with honours from the Legal Administration/Law Clerk Advanced program at Durham College. 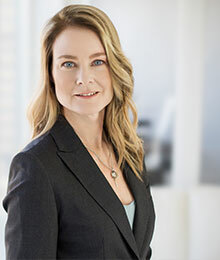 In 2001, JoAnne resigned from her position as a junior Law Clerk at a prestigious downtown Toronto law firm and set off in search of adventure. She and two friends drove across Canada and landed in Whistler, BC. While living in Whistler, JoAnne worked for Intrawest and in real estate. In her spare time, you’ll find JoAnne in the gym, practicing yoga, or at the lake. Elizabeth was born and raised in beautiful British Columbia, embracing from a young age the spirit of the West Coast: diverse, enterprising, and adventurous. Growing up in this area of the world, Elizabeth spent countless hours in the outdoors, cultivating skills that would later prove invaluable in her career as a legal recruiter. Conscientious, dedicated, resourceful, and armed with perseverance, Elizabeth is passionate about delivering results to her clients seeking to hire and the candidates she represents during their job search. After graduating from the University of British Columbia with a major in English Literature and a minor in Biology, Elizabeth went in search of her next challenge and found the perfect fit in legal recruitment. 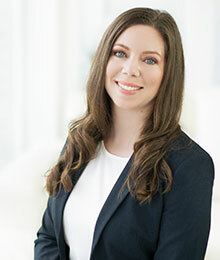 Since 2008, Elizabeth has worked closely with law firms and companies of all sizes, successfully placing Legal Administrative Assistants, Paralegals, and Legal Management professionals at all levels. She is committed to providing support at every stage of the recruitment process, ensuring an efficient and effective hiring process for all involved. When she is not in the office, Elizabeth can be found on a mountain, out on the water, or in the park with her Rhodesian Ridgeback, Mikaela.